I turned the little log cabin hexagon block that I was playing around with a few weeks ago into a coaster/mug rug/mini mat. I can't believe how much better it looks finished! I trimmed down the gray borders a bit, which helped balance the proportions. I love what the quilting adds, too! It matches my favorite coffee mug perfectly! This tutorial was super helpful for binding those tricky angles. 5 out of 6 of the angles were spot on, so I'm calling that a win! :) I'm giving myself extra bonus points for using up some bias binding that I had leftover from this quilt...it was just enough! The black and white binding reminds me of an old diner floor....in a good way! This is scrap project #109. 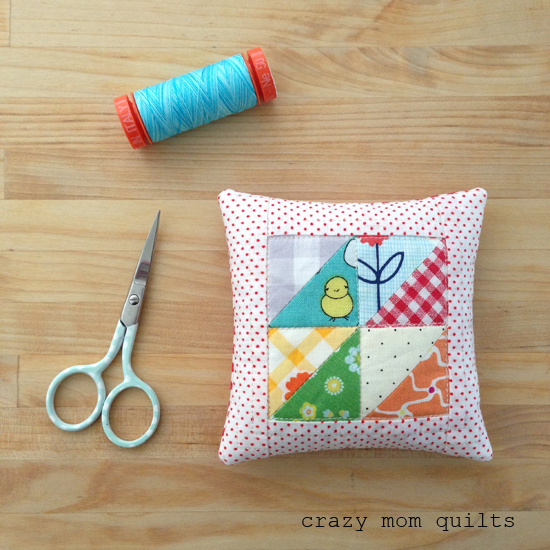 I had a few spare half square triangles floating around, so I turned them into this cutie pie little pincushion. I hate to pick favorites, but this one HAS to be right up there. Look at that little chick! Eeep! I love that something so simple can be so cute! This is scrap project #110! The pincushion party for Good Neighbors has wrapped up this week! Check out the amazing work by Adrienne, Cindy, Amy, Chase, Rene, Erin, Nicole, and Teri. If you want a chance to win a fat quarter bundle of Good Neighbors fabric, be sure to enter here!!! (Open to US and Canada only.) In that post you can also see ALL of the pincushions from the entire party in one mosaic. So much fun! I hope you enjoyed the pincushion party as much as I did! Now it's your turn to link up. Thanks for joining me for finish it up Friday! I hope you have a wonderful weekend! Love your little mug rug! You're right, the binding does look like an old diner floor. In a good way! Hope your mug of something warm keeps you cozy this weekend! Cheery and Fun! Mug rugs are great little things to add some fun to a room. I really like the binding idea. 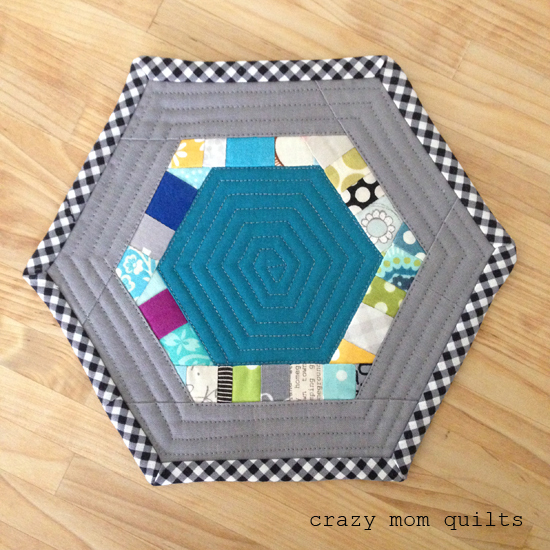 What a gorgeous hexie mug rug. Thanks for sharing the link for binding angles that aren't 90 degrees. I have a mini in mind that this will be very useful for. Thanks for the tutorial link for binding differnt shapes. 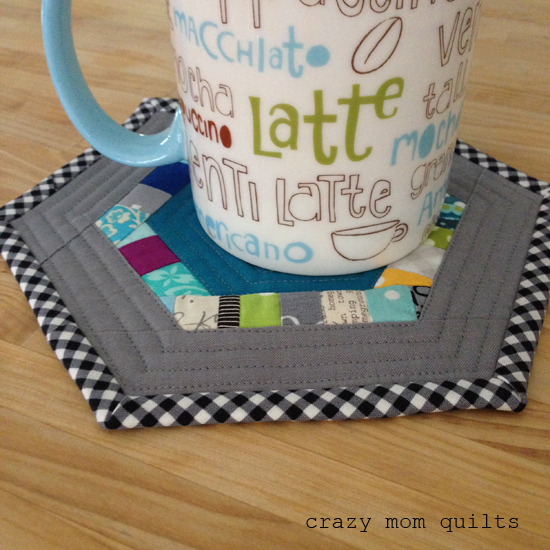 The mug rug is beautiful, and I've enjoyed following the pin cushion blog hop! Both are very cute.... But I must say I love that little hexagon mug rug the most! What an adorable pin cousin!!! I love it! I am so glad you started keeping track of your scrap projects again. I loved the first 100. These are great! Just popping by to let you know I love everything about your hexagon mug rug/coaster. It has my favourite colour in the middle, lots of colourful bits framing it, dark gray to set it all off and a great binding to finish it off. Your mug rug is awesome. The colors in this little cutie are stunning. Oh my! Enjoy! I love that pin cushion! How adorable! Thank you! that little pincushion made me smile! I made a pincushion...that has also turned into a new quilt endeavor...thanks to all this pincushion happiness! I love your "Good Neighbors", and have really enjoyed the party!!! Have I told you that your blog is one of my happy places? I get filled up when I visit. Your latest scrappy projects just make me smile. I like your cute little mug rug. When doing the quilting on it, do you start stitching in the center and work outwards? Thanks. SO cute! What a great way to use up scraps. Sweet . . . I like the gingham binding too. That little chick is so sweet. That mug rug is a win too. Cute! I am hooked on pincushions too. When you want to sew without to much pressure but have a quick finish, they are the ticket!